The Days of Johann, an agility dog! : Dog Agility Masters Team shirt! Dog Agility Masters Team shirt! Mum and I have been working on and designing our DAM team shirt for USDAA Regionals coming up July 4th weekend. 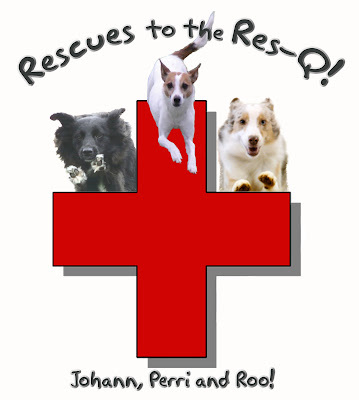 All of us are rescue dogs, so we worked together and came up with the team name "Rescues to the Res-Q!" I think it turned out pretty well. What do you think? Mum and I have a three day AKC Trial starting tomorrow through the weekend. The facility is indoor, air conditioned, on really nice soccer turf that's cushy, and it's only 5 minutes from our house. We're going to give it our all! Wish us luck! I love the t-shirt design! That is very professional looking. Best of luck at the trials and have lots of fun, as I know you will. good luck at the trials. I got to go and cheer on Jet last weekend. Nice shirt! My Mom's not that talented -- she's doing good to remember agility courses, which is exactly what we'll be doing this weekend up in Maryland. Isn't it great to live so close to a trials? We have a USDAA one about 10 minutes from us so we're entering it every time!